I’m sure many of you have seen on FB timeline, instagram on the latest hair trend – Glow in the Dark Hair! And I’m glad to share that Artistry Hair Professional is the first in Singapore that brought in the special hair dyes that create the Glow In the Dark effect! My previous hair colour was nearly 3 months ago, so Elein decided it’s time for a new coat of colour and we will be using the new Glow In the Dark Hair dyes on my tresses! Super excited! You know, the hair dye process is almost the same each time so let’s go straight into the Before & After Photos! Unruly faded hair with outgrown roots, and viola, nice treated hair that is so smooth and fresh coats of colours! Green on one side, blue on the other with pink mixture! Happygirl90 with her newly coloured hair! The colours this time round is bright! And I’m loving it! I love being different! Haha. And the fact that I’m one of the first who got to try out the Glow In The Dark Hair Colours! Check out the various colours on my head! Only 3 dyes was applied, green, blue and pink but due to my previous colours, I’ve purple and different shades of blue too! Too Pretty already!! Elein really have magic hands! Hehe! Here’s a little close up on the glow in the dark effect under UV light. Sorry for the “noisy” photo as it’s taken under minimal light with the iPhone. Interested to try out the Glow In The Dark Hair Trend? 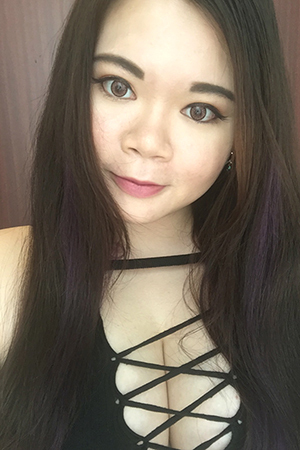 Look for Elein at Artistry Hair Professional at International Plaza and quote my name ‘Joyce’ to get 10%-30% off depending on the hair services that you are doing. Making an appointment before heading down is recommended! Today’s FOTD is a very simple look which features bright pink lips. The easiest way to wear bold bright colors on the lips is to keep the rest of the face simple and clean. This is so we can have the focus on the lips. Defining brows is a must in all sort of looks but you can keep the eyes clean like what I did. I have received this Evangelist Nobuto BB Cream sample during the Tokey Luxey meet up last month. Have been trying it out for a couple of times and I like how it wears on the skin. Here’s a swatch of the bb cream. The texture is towards the runny type and not too thick which makes it easy to blend during application. You won’t have situations where it looks as if you applied too much just because the product is too thick. Which means you can also apply more if you find that the coverage is not enough for certain areas. Here’s a half face photo after applying the bb cream. You can see that it evens out the skin tone and it provides medium coverage to cover up redness and flaws. As I have mentioned, you can apply a little bit more product to up the coverage on required areas. The shade Ochre No1 suits me just nice. This BB cream can be used as a makeup base or as your foundation. What I usually do is that I’ll set it with either a loose powder or a two way cake if I wanted more coverage. The Evangelist Nobuto BB Cream is a top 3 product on Cosme and I think it lives up to that ranking! It’s back to Salon De Choix for some hair pampering and this time I decided not to do any colouring as the previous colours are still holding up well. The fringe part faded a little but it faded nicely so I’m leaving it as it is for now. Before the usual pampering hair mask treatment with steaming, I get to enjoy a scalp treatment first! The pores on my scalp are being opened up by combing so that it can be cleanse properly. Massaging the minty treatment essence into the scalp. This part is just shiok. Your scalp is getting treated and you’re getting a head massage too! Check out the shape of my bob hair without any styling. Short hair is addictive I tell you. Though I miss my long hair, I still want to keep this length for awhile more before going back to long hair. Here’s my hair after all the awesome treatments and trim! I got Ricky to trim my fringe shorter as it’s poking in my eyes. Look how smooth my hair is! Pamper yourself by getting a treatment done for your hair! Enjoy 15% off all regular hair services when you quote “Joyce” when making your appointments! Call them at 6836 2959! Salon De Chiox located at Winsland House(5 min away from Somerset Mrt)! CNY is approaching and other than new clothes, new shoes, we need a new look for our hair too! So it’s back to my trusted Salon De Choix for a new look! As usual, I gave my stylist the freedom to do whatever he wants with my hair, that is unless his idea is too over but so far so good. 😛 So after deciding on the look, we get started with lightening parts of the hair. Unlike previous times where we just bleach the sides, we started from the fringe back. We also cut the back of the bob a little shorter then usual with the sides longer so it forms a gradient. There’s many ways to wear this hair. Just show a little of the red by the side. Sweep the fringe to the side more to show a two toned fringe. Put some of the hair behind the ear to show more of the red. Or just put all the brown hair behind the ear showing the full glory of the red. Here’s how the side looks like. A nice gradient and you can see the red peeking out. If you have not get your hair done for CNY, make an appointment and head down to Salon De Choix now! They will be closed from 30th Jan to 5th Feb so be quick!